Contrary to the recumbent bicycle, the H-Zontal places the head forward. This is the natural posture of all animals, they all move with their head forward ! Besides when he swims or crawls or walks on his four feet his head is kept forward. Try to do the same with the head behind : you will feel it weird ! All the people that tested the H-Zontal bike can give evidence : learning how to ride in the lying position is fast, very comfortable and easy to control the bike. You would feel safe very fast. 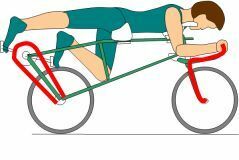 Furthermore, this position allows the cyclist to have a better vision when he crosses the road. The fact that the hands are put forward and closer to the front wheel, the driving is facilitated. Putting the feet at the back allows to set the crank gear closer to the rear wheel. Hence, the mechanical construction is simplified.